This month a unique vehicle powered only by nearly 600 SunPower® solar cells will speed down a runway at 65 mph in the Mojave Desert to break a world land speed record for fastest solar car. 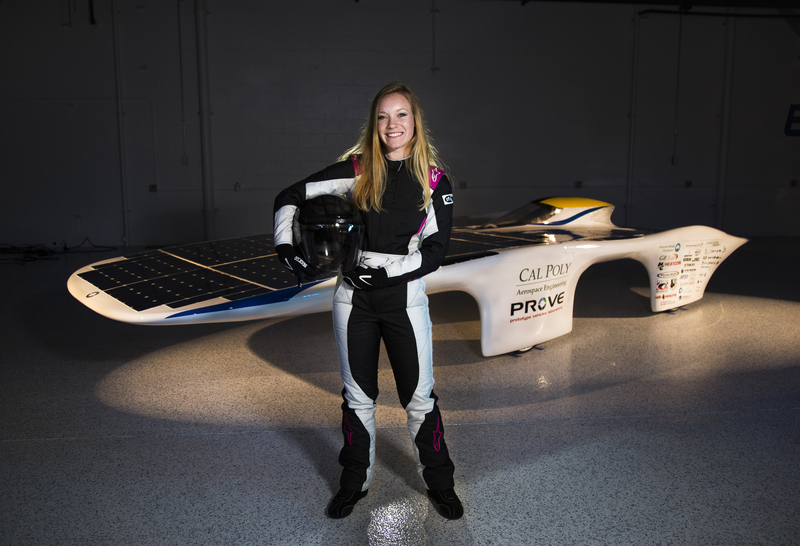 “Dawn,” built almost entirely by students at the Prototype Vehicles Lab (PROVE) at California Polytechnic State University in San Luis Obispo, Calif., and driven by aerospace engineer Lacey Davis, aims to smash the existing 56 mph record achieved by a car in Japan in 2014, according to Guinness World Records. Dawn actually doesn’t even have a proper steering wheel, and it definitely doesn’t look like a normal car. It’s an electric vehicle, yet it has no batteries or any other energy storage system. Faced with the blank page that comes with record racing, the PROVE team had virtually untamed creative license to design a vehicle that has less than 10 percent of the aerodynamic drag of a typical family SUV. Since it’s mostly made of aerospace-grade carbon fiber, it’s so light that a few people can easily pick it up. The record requirements are simple: It must have four wheels to be called a car, and it has to have a human driver in control at all times. To make it safe, the team added a steel roll cage and a few other innovations, such as an “anti-flip-flap,” which pops up and kills any lift if the wing-shaped body starts to become airborne. This isn’t something practical you’ll be driving to the store anytime soon, though. PROVE Lab’s mission is simply to show the world what can be done with solar power and a bit of imagination. We deliberately didn't use expensive satellite-grade cells and instead covered the car in the same high efficiency silicon cells SunPower uses in its commercially available solar panels. We want to emphasize that this is technology you can buy and use today, just wrapped up in a futuristic package and doing something slightly bonkers. Breaking records is often how we get a meaningful measure on progress in science and technology. Faster, further, higher, better. 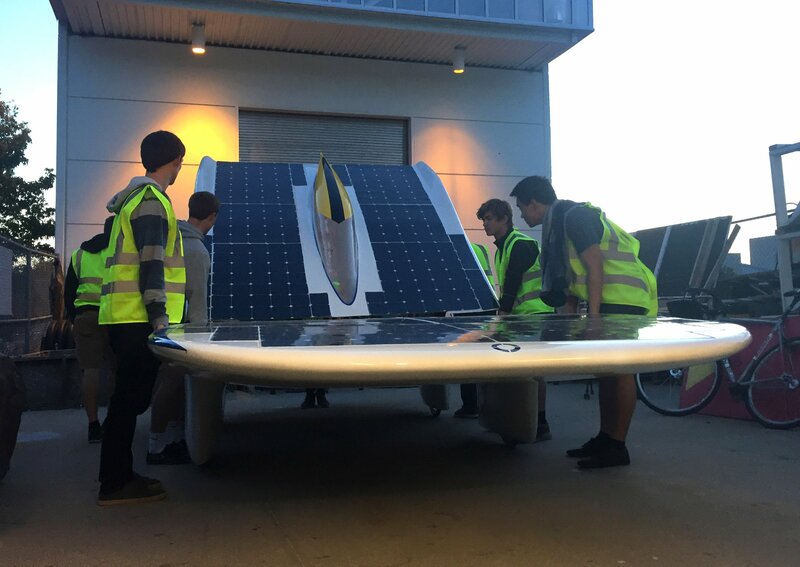 It’s a tangible demonstration of where we’ve been and where we’re going, and it’s the reason we are drawn to inventions like Solar Impulse 2, the SunPower solar cell powered airplane which set a world record when it became the first solar-powered plane to fly around the world two years ago. SunPower has long understood the value of applying its innovative technologies to help solar pioneers achieve records, using what it learned to develop better products and to communicate how efficient its technologies are when it comes to helping homeowners, businesses and entire states transition properly to clean energy. As solar adoption spreads, the cost continues to drop, emissions decrease and people feel positive about achieving a clean energy future. However, for those of us in the record-breaking business, we’re also pretty familiar with the other type of responses, the, “That’s impossible,” comments. Dawn is a good example, given how often the students have heard that it can’t be done for at least 50 different reasons. Nobody ever said building a solar car that could cruise at freeway speeds on the same amount of energy that it takes to run a toaster would be easy, but it was always possible — a challenge of perseverance as much as anything. College students know it’s possible, with enough late nights and a slight hit to the GPA! Middle schoolers are just surprised it hasn’t been done already. A 5-year-old simply assumes that all cars will be built like this in the future. So why is a solar-powered family car taking as long as the infamous flying car to become a reality? It’s not really the energy density of batteries, or any barrier thrown up by the physics of efficiency in photovoltaics. It’s that the “impossible” crowd has had too loud a voice for too long, whatever their motivation. Companies from Audi to ambitious startups such as Sono Motors are showing it is possible to make an effective solar-battery car for a daily city commute, and if they don’t succeed in being the first to market, then eventually someone else will. I’ve been involved in solar cars for a decade now, starting with the Sunswift team in Sydney, Australia, where I designed the bodywork for “IVy” as a student, and then as an academic overseeing the development of “eVe.” Both vehicles achieved solar and electric vehicle records and were powered by various evolutions of SunPower’s technology. PROVE Lab’s car, Dawn, is just the latest in a long line of innovations that use SunPower solar to push the boundaries further out. In about two and a half years, students from 13 different majors at Cal Poly have gone from “impossible” to, we hope, “inevitable” for their own slice of solar power history. We look forward to seeing who will be next to rise to the challenge! Guest author Graham Doig, a Lockheed Martin Endowed Assistant Professor at California Polytechnic State University, is the Founding Faculty Advisor for the university’s Prototype Vehicles Lab. Doig is a Faculty Fellow, Center for Innovation and Entrepreneurship, and Director of the Fluids Laboratory for Interdisciplinary Projects (FLIP).